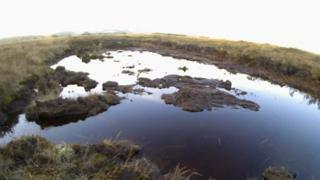 Natural Resources Wales' (NRW) £4m project hopes to improve the condition of Welsh raised bogs. Environment and Rural Affairs Secretary Lesley Griffiths will visit the internationally renowned wildlife site at Cors Caron, near Tregaron, Ceredigion on Thursday. She said the "ambitious" scheme would have several long-term benefits. The bogs are created over thousands of years when bog plants turn into peat, and can store large quantities of carbon that would otherwise be released into the atmosphere. But the rare habitats have been affected by centuries of peat cutting and drainage. Emyr Roberts, chief executive of NRW, said: "To some people, a bog may appear rather barren and unimportant. But in reality the complete opposite is true. A healthy bog brings great benefits to wildlife and people. "They are home to rare plants and animals, including the large-heath butterfly and the iconic bog rosemary. They also help fight climate change by storing carbon, and are great places to visit to enjoy nature and all the benefits of being active outdoors." The project will work on seven of the most important bog sites in Wales: Cors Fochno near Borth and Cors Caron near Tregaron in Ceredigion, Fishguard in Pembrokeshire, Trawsfynydd in Gwynedd, Crosshands in Carmarthenshire, and Crickhowell and Builth Wells in Powys. An EU LIFE programme grant and NRW have funded the four-year-programme, supported by the Welsh Government and the Snowdonia National Park Authority.